The lights must have blinded her at first. The glittering luminescent chandelier, the spotlight that set her figure aglow. Carnegie Hall's sparkling lights must have blinded Nina Simone as she strode across the stage and sat at her piano. Did she feel fear when she gazed out a thousand white faces that stared back at her expectantly? Knowing Nina, I think not. And it would be one of the first recordings of Nina Simone’s music that I would ever hear. I was probably still in my teens and one of the only things I knew about the woman who was born Eunice Waymon was that she was cool enough for Lauryn Hill to reference in a Fugees song. When an algorithm in some internet radio player selected and subsequently released a spry refrain of bass, guitar and drum cheerfully blended together, I was intrigued. “The name of this tune is Mississippi G—m,” Nina said in her feminine tenor. The audience’s next response was a collective unsure chuckle. I found that I was immediately enamored with Simone’s artistry. I loved the way she blended cheek with an anger evoked by oppression, making them the heart and soul of a protest song sung over what could have been the score of a Broadway musical. I would fall in love with Simone’s work a second time as I watched my high school’s dance company undulate and leap to “Four Women.” The dancers were characters in the stories Nina told, their skin tones and movement matching the appearance and mood of the women in each vignette. It was through “Four Women” that I truly began to comprehend the importance of Nina Simone. With "Four Women" she had managed to encapsulate the struggles of black womankind in less than five minutes. Nina was the black woman’s lyrical historian, a bard who sang our history and archived our triumph and shame with sound. That song spoke volumes to me about the triple consciousness of being black, female, and American in a way that no one else had perhaps other the first time I had heard The Mis-education of Lauryn Hill. After that Nina Simone would become for me both muse and teacher representing a black femininity that was Afrocentric, sharply intelligent and ensconced in social consciousness. Her sculptured hair, her brazen denigration of racism and her belief in the beauty of blackness were all things I wanted to imitate. 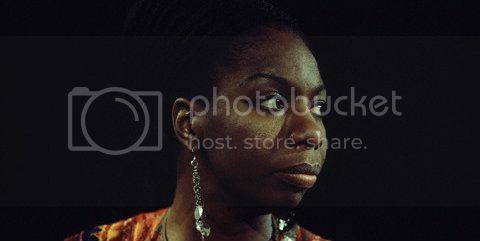 Nina Simone’s throat was a revolver and her words were bullets that pierced prejudice. She sung truth and transmuted apathy into so many shards of glass with the machine gun of her voice. As I consider who Nina Simone was and what she stood for in the year she would have turned 80, I believe that this is her legacy: truth and passion. Perhaps in no other song was she more truthful or more passionate than in “Mississippi G—m.” That night in 1964 at Carnegie Hall Nina transitioned from entertainer to a human clarion call naming the sins of a segregated America. She artfully expressed dissatisfaction with the pace of social change by integrating elements of blues and gospel. During her performance Nina Simone sings the words “desegregation” and “mass participation” and male voices respond with “too slow,” embodying the collective voice of a righteously impatient black America. To sing such a politically charged song in 1964 took incredible courage. It took a level of zeal and integrity that surpasses fear. That remarkable authenticity and ardor was Nina Simone’s genius and it was her gift to us. Assita Camara is a writer residing somewhere below the Mason-Dixon. She writes about culture at her blog The Afro-Modernist and crafts prose about culture, herstory, and life at her philosophie. You can follow her tweets about music, poetry, and technology at @assitawrites.